Turkish prosecutor Mehmet Selim Kiraz, who is heading the inquiry into the death of teenager Berkin Elvan during anti-government protests in 2013, has been taken hostage by gunmen in Istanbul. Dramatic images have emerged on social media of a gun being held to the head of Mehmet Selim Kiraz at a court house in Istanbul. A banned Marxist revolutionary group is said to be behind the incident. A statement posted online said Mehmet Selim Kiraz would be killed if their demands were not met. 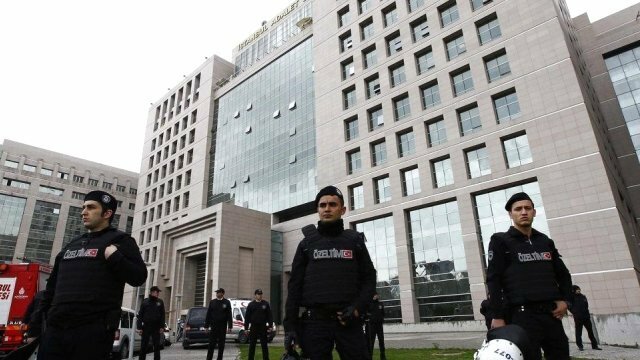 Turkish special forces entered the court house, which was evacuated, and gunshots were heard from inside the building, Turkish news agencies reported. City police chief Selami Altinok told reporters that negotiations with the hostage takers were under way. “We are trying to resolve the issue without anyone being hurt,” he said. The Turkish government has banned live TV coverage of the incident, citing security concerns. Berkin Elvan, who was then 14, was struck in the head by a police tear gas canister in June 2013 as he went to buy bread during mass demonstrations that began in Istanbul and spread across Turkey. After nine months in a coma Berkin Elvan eventually died in an Istanbul hospital. President Recep Tayyip Erdogan inflamed passions shortly after Berkin Elvan’s death when he said the boy had been carrying a slingshot and had been “taken up into terrorist organizations”. Suspected members of the Revolutionary People’s Liberation Party-Front (DHKP-C) took the prosecutor hostage on the sixth floor of the Caglayan court house, reports said. A website close to the group has published a series of demands, including calls for an immediate confession from police officers responsible for the boy’s death, and for an end to prosecutions of protesters charged over the clashes. The DHKP-C is considered a terrorist group by Turkey, the European Union and US. It said it carried out a suicide bombing in February 2013 at the US embassy in Ankara, where a security guard was killed.